"Leadership is not about a title or a designation. It's about impact, influence and inspiration. Impact involves getting results, influence is about spreading the passion you have for your work, and you have to inspire team-mates and customers," says Robin S. Sharma. The amiable and intuitive President of our beloved church, Pastor (Dr.) Abraham Olakunle Akinosun is in the category of leaders who made positive and unquantifiable impacts in their generation, particularly in the lives of people. 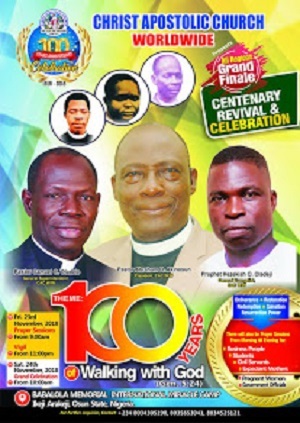 Majority of well known ministers of God in CAC this day passed through him when they were in Seminary. He thought most of them. Infact, the General Superintendent of the Supreme Council faction of CAC, Pastor Adeoloye said recently that Pastor Akinosun was one of his lecturers while in Seminary. Good leaders are trailblazers, making a path for others to follow. Great leaders, however, inspire their people to reach higher, dream bigger, and achieve greater. Perhaps the most important leadership skill you can develop is the ability to provide inspiration to your team. Pastor Akinosun has not only continue the good work his predecessor, the Late Pastor Olusheye started in CAC Worldwide, but he has also set so many enviable records. Pastor Akinosun was born on 27th February, 1945. He had his Primary school education between 1955 and 1960. After that, he immediately went into plumbing trade under the then Ibadan City Works from 1962-65. He passed his grade 2 and 3 trade tests in plumbing and worked with many companies like Drake and Skull Limited, Julius Berger, G. Cappa, Italcom and many others. He was called to the gospel ministry in 1972. He then attended CAC Bible Training College from 1973-75. He worked as Catechist at CAC Oja-Odan. Thereafter he was posted to CAC Yaba. In 1978, he travelled to Europe for further studies in Theology. He studied in West Germany, Sweden, and Belgium. In Belgium, he attended Continental Theological Seminary where he obtained a degree in Biblical Studies. He was ordained a Pastor in CAC in 1981 and posted to CAC Epinmi Centre. In 1982, he was transferred to CAC Theological Seminary, Ile-Ife as a Lecturer. In 1984, he was transferred to pastor an assembly on Polytechnic Ibadan campus. In 1985, he was transferred to CAC Sanngo, Ibadan and in 1991; he was promoted to the rank of District Superintendent and posted to CAC Itire as District Superintendent. 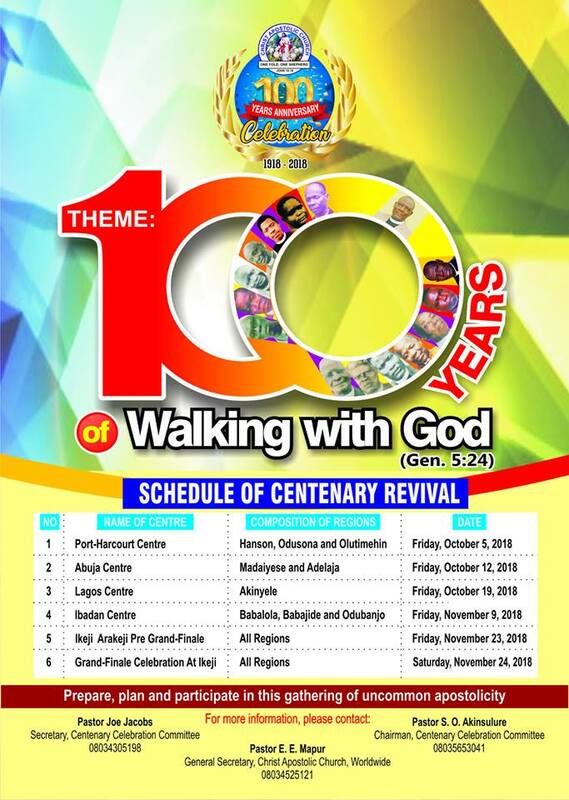 In the year 2000, he was posted to CAC Oshogbo DCC as the Chairman, the position he held until his recent appointment as the General Superintendent, Christ Apostolic Church, Worldwide on 9th December, 2010. 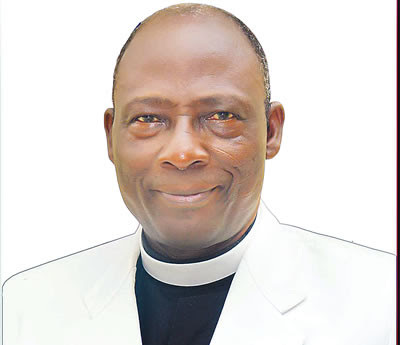 Pastor Akinosun is a renowned author and has published 12 books, including: Pastoral Theology in Action, The death of the martyrs, The 12 apostles of Jesus Christ, Improve your preaching (Homelethics), etc. Also, in appreciation and recognition of his humanitarian services in the society, the Osun State Government of Nigeria honoured him with the title: “Justice of Peace” (JP) in 2002. He has also served as the Chairman, Christian Association of Nigeria (CAN), Osun State Chapter between 2002 and 2010. He was appointed the President on December 31, 2011.